Grease an 8-inch-square baking pan with nonstick cooking spray. Line bottom of the baking pan with parchment paper, leaving an overhang on two sides; spray paper with nonstick cooking spray. Using a double boiler, combine butter and 1 cup chocolate chips. Heat, stirring occasionally, just until melted, 3 to 5 minutes. Remove mixture from heat; stir in sugars and salt, then eggs, and finally flour, until just combined. Pour batter evenly into prepared pan and bake for 30 to 35 minutes or until done. 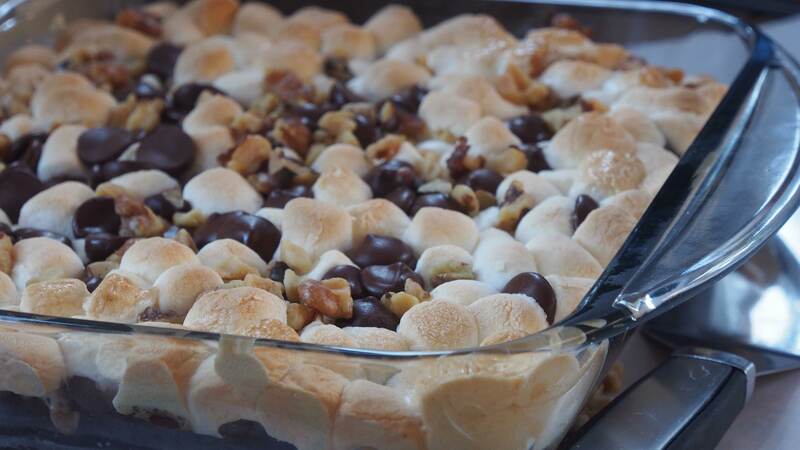 Remove brownies from oven, and sprinkle with remaining chocolate chips, marshmallows and nuts. Return brownies to oven and bake until chocolate is shiny and marshmallows are puffed, about 5 minutes. Remove from oven and cool completely in pan. Use the paper overhang to remove brownies from baking pan.